It's really something to browse through iTunes' offerings. There is no shortage of radio representation, including some vintage classic radio programs. A lot of it is free. Now when you have the ability to choose exactly what you want, when you want it, you start to understand why traditional radio might be having a bit of a hard time competing. It was made clear to us back at radio school that a lot of younger people have literally no connection whatsoever to the AM side of the dial. FM still seems to be on their radar. Everyone is walking around with an MP3/I-Pad/I-Phone/whatever nowadays. The future of media is pretty clear because we are living it. Still, FM continues... It's free, but you are not in control. Music on AM is a pretty bad idea, as a lot of stations have discovered in recent years. The sound quality for music on AM is just not there. Interestingly enough, sound seems to be a lot better on the Internet feeds of some AM stations than on the stations themselves. 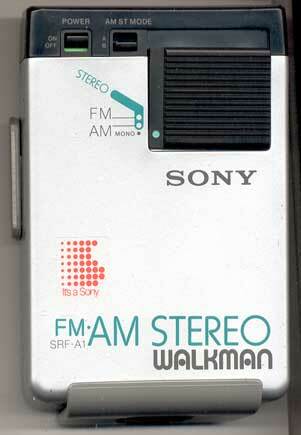 We can also remember something called AM Stereo, although I've never actually used an AM stereo receiver. How well did that work? It did little if anything to hurt the FM dial, that's for sure.